Welcome to our Election Update for Tuesday, Oct. 9! Things look good for Republicans in the Senate. According to the Classic version of our forecast,1 the Grand Old Party had a 7 in 9 chance (78 percent) of keeping control; in fact, they might even pick up seats.2 However, in the House of Representatives, the Democrats were in the lead. The Classic model gave them a 3 in 4 chance (74 percent) of winning the House. 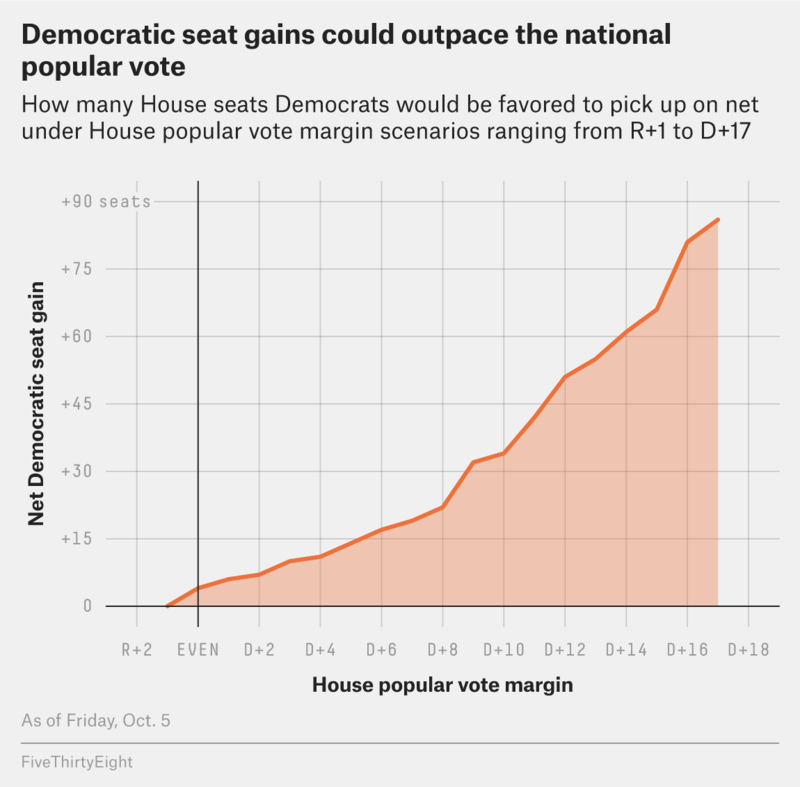 If we drill into our House forecast, we expect the national House popular vote to favor Democrats by 7.8 percentage points, which translates to roughly 228 Democratic seats and 207 Republican seats. But what if the House popular vote shifts before Election Day? What if a blue tsunami crashes ashore and Democrats win nationally by 17 points? Or what if Republicans roar back in the polls and win by 1 point? What would happen to forecasted Democratic gains? It’s like a switch is thrown at D+8 that causes actual Democratic seat gain to go from behind their popular-vote gain pace to well ahead of it. So what happens at D+8? Republicans’ structural advantage in how districts are drawn (gerrymandering, as well as the phenomenon of self-sorting, whereby Democrats tend to cluster in cities, which are already heavily Democratic) begins to erode. That advantage normally allows Republicans to keep control of the House while still losing the popular vote by a modest margin. But if Republicans lose the popular vote by too much, their firewall might break all at once, and Democratic gains could multiply. 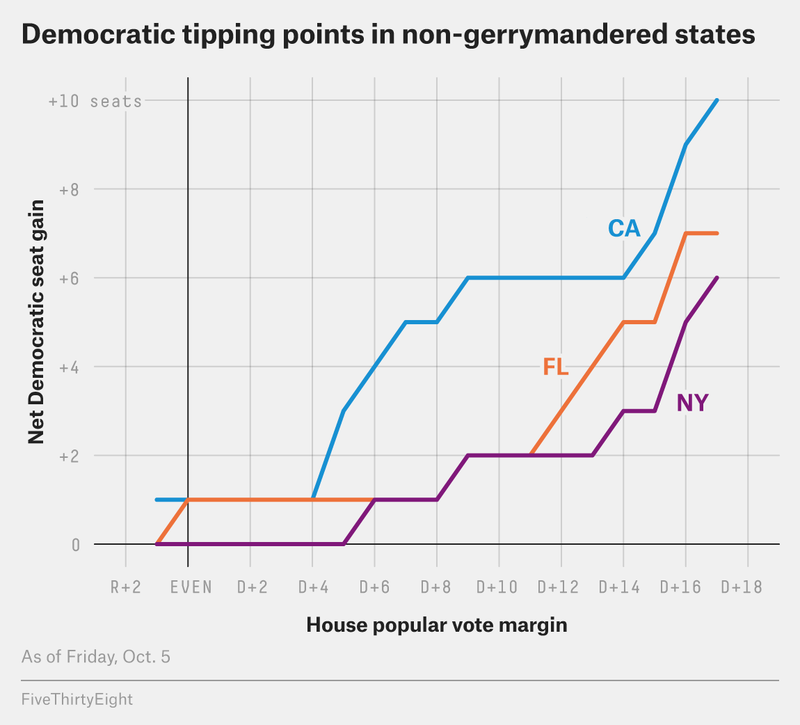 For example, let’s see what happens in GOP-gerrymandered states when Democrats rack up huge popular-vote margins. 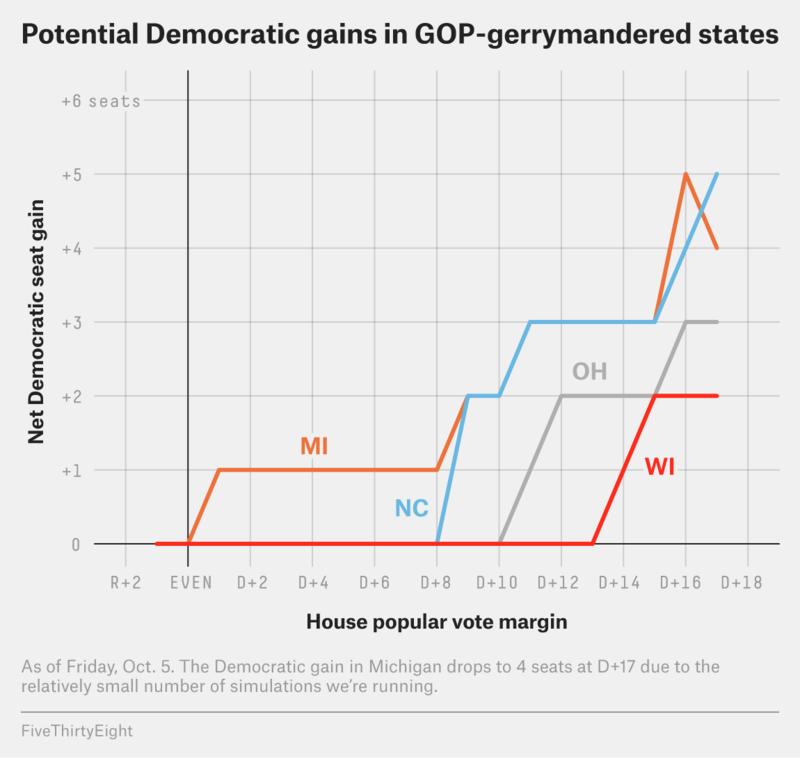 According to our model’s outputs, in Michigan, an 8-point Democratic win in the national popular vote would produce only one Democratic gain — but a D+16 wave would produce five. In North Carolina, Democrats would make zero gains in a D+8 scenario, but they’d flip five districts if they win the national vote by 17 points. In Ohio, Democrats could win the national popular vote by 10 points and not pick up a single seat, but go to D+16 and they could flip three. In Wisconsin, the difference between a D+13 environment and a D+15 environment is the difference between no Democratic pickups and flipping two districts. The phenomenon is also present in states where Republicans didn’t have free rein to draw the maps they wanted. Virginia’s current congressional map is a hybrid of a Republican plan from 2011 and a court-drawn revision from 2016; in the commonwealth, Democrats pick up no seats in a D+3 scenario but zoom up to four wins if Democrats win the national popular vote by 13. Under Texas’s map, which was imposed by a three-judge panel but which Democrats still criticize for allegedly discriminating against nonwhite voters, going from D+8 to D+17 would mean Democrats go from zero to four gains. What’s more, in states whose maps were drawn to favor Democrats, the same problem exists: In Illinois, even if Democrats win the national popular vote by 10 points, there aren’t any places left for them to make gains. But win it by 12, and Democrats are favored to flip four seats in the Land of Lincoln. The floodgates could open wide for Democratic gains even in states whose maps were (theoretically) impartially drawn, so simple demographic patterns play a role, too. In California, which has an independent redistricting commission, the difference between a D+4 environment and a D+7 environment is an additional four Democratic gains. Go from D+14 to D+17, and Democrats gain four more. The party projects to net one district in Florida (whose maps were drawn by a court under the state’s Fair Districts amendment) if they win the national popular vote by 8 points, but they could bag as many as seven if they win it by 16. And even though a court also drew New York’s congressional districts, Democrats could gain six seats if they win nationally by 17 points — up from just two Empire State districts if they win nationally by 13 points. Certainly, though, not every state’s map is built this way. The effects of Republican-controlled redistricting and racial polarization are so strong in Alabama, Louisiana, Mississippi, South Carolina and Tennessee that Democrats don’t have any realistic pickup opportunities under any of the scenarios discussed here. On the opposite end of the spectrum, maps in Connecticut, Maryland and Massachusetts have already been drawn so effectively for Democrats that there is little to no room for the party to grow. So if Republicans incur massive losses in November, most of them are going to be in a handful of states — those whose maps, intentionally or not, are drawn to Republican benefit. The 2018 election may finally show us just how strong that Republican firewall is. As of 9 p.m. Monday. We gave them a 47 percent shot of picking up at least one seat. I picked D+17 and R+1 as my endpoints because the model gives anything more extreme a very unlikely chance of occurring. 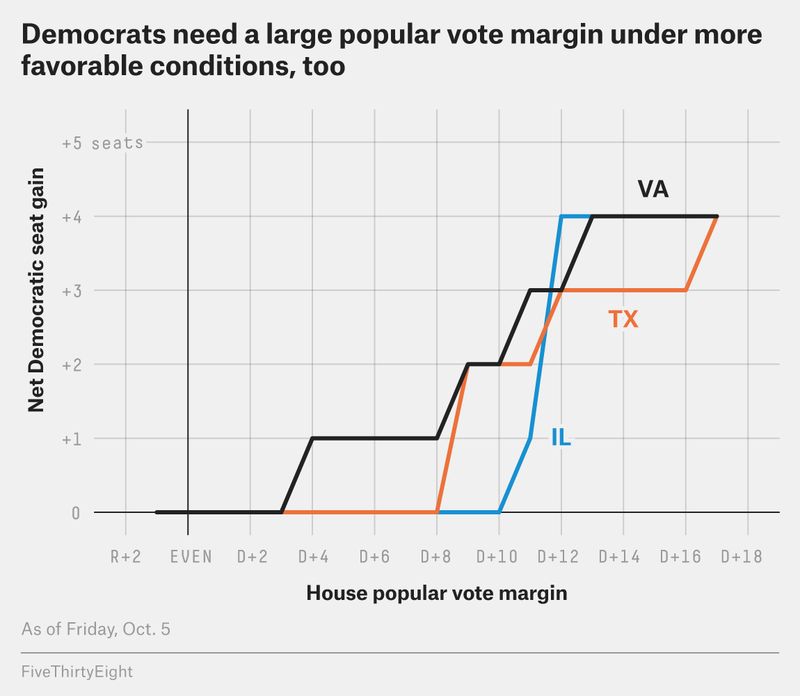 According to FiveThirtyEight congressional model runs on Friday, Oct. 5.